Did you know that May is Celiac Awareness Month? I have a handful of friends who have Celiac Disease so I am familiar with the problems it can cause. I am sure you do too, as approximately 1 person in 140 is known to have Celiac Disease, which can remain silent for decades and become apparent at any age. Over the years, it has been a trend to eat a gluten free diet, but for those suffering with Celiac, it is not a trend--it is a MUST! Just a the tiniest taste of gluten will trigger debilitating gastrointestinal discomfort. 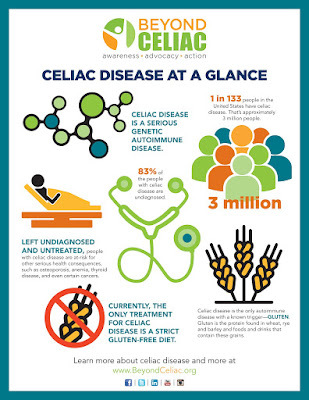 Want to learn more about Celiac Disease Awareness Month? Please visit: https://www.beyondceliac.org/celiac-awareness-month/ or https://celiac.org/awarenessmonth/.